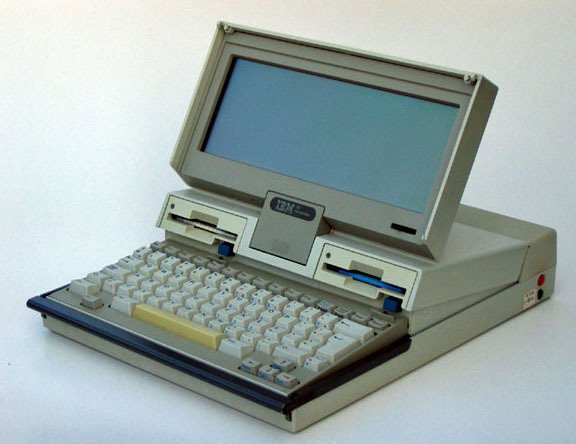 Released on April 3rd 1986, the IBM 5140 was the first laptop from IBM. Sporting a semi-clamshell design where the display closed over the keyboard. but there’s a big lump of computer behind the open display. the 5140 was not a very attractive unit. 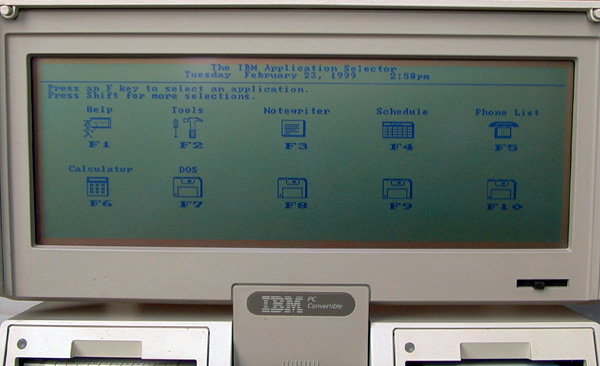 With 2 new-fangled 3.5″ floppy disk drives, and a pretty good keyboard, the IBM convertible PC had one really glaring deficiency – the mono, reflective and low-res LCD screen with no backlight. The best part of the display was that is was removable, so you could put a hulking great CRT on top of the laptop when using it at the office! On second thoughts the best part was that the floppy disk drives tilted upwards when you opened the display. Very cool! The 5140 weighed 13 pounds (5.8 kg) and featured a built-in carrying handle, which sort-of doubled as a wrist rest. Size: 12 x 15.94 x 2.76 in, 30.5 x 40.5 x 7 cm. Not sure if it was a first – but certainly one of the earlier implementations of a suspend mode for a PC. The IBM convertible ran off batteries and used a CMOS core 80c88 processor, which could be clocked down to zero Hz thereby conserving power. The optional printer clipped to the back, making the brute even less portable.